Guest blogging has been around for a long time, but it’s an especially hot topic now. With the concept becoming even hotter daily, it’s quite natural that myths emerge. This post looks at three myths around guest blogging that have been actively discussed recently. Those who think guest posting is done for link-building—and measure the guest posting campaign by the number of links—completely don’t get it. There’s so much more to it, which you’ll miss if you focus on links. In fact, I’ve been discouraging guest bloggers from thinking about links overall: just stop building links while guest blogging. Period. Focus on other benefits of guest blogging. The most important benefit of guest blogging is building influence. It’s a long-term asset which is almost impossible to measure, but is absolutely priceless. One thing you need to remember is that when you’ve built influence, you don’t need to care about links at all. Once an influencer creates anything, it will acquire links by itself. When you become an influencer, your followers and followers of your followers will link to and share your content eagerly without you ever asking them. Guest blogging is by far the most effective way to build influence. Look at any influential blogger out there—most of them started by guest blogging. Moreover, they now admit that they’ve achieved online success due to guest blogging. Leo Babauta, creater and founder of Zen Habits, built his influence via guest posting. 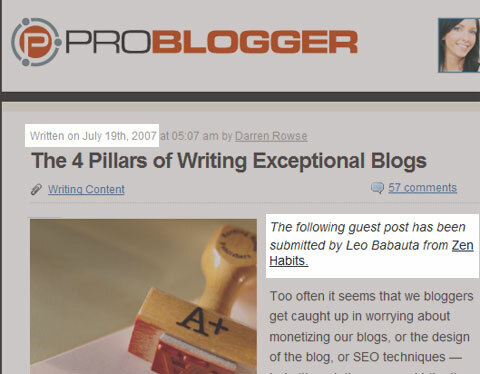 Here's his guest post at Problogger.net that dates back to 2007. Because people give back what they’ve received, it means that you can increase the level of whatever you want from your coworkers and employees by giving it first. If you want more information, you provide it to them. If you want to create a feeling of trust, you offer it first. If you want to foster a cooperative attitude, you show it first. By acting first, you get to set the tone for the type of workplace relationships you want. Guest blogging is by far the most powerful way to give. You give high-quality content, share your expertise and people start following you in return. Myth #1 busted! Guest blogging is only effective when you focus on long-term benefits (i.e., influence-building, networking, branding, etc.) and not on instant results (traffic or links). I love guest posting, it’s like going on a little bloggy holiday. Yes, it’s about linking… again. Nowhere on the web will you find a direct statement that Google thinks guest blogging is bad. Here’s my way to deal with all the “Fear Uncertainty Doubt” around Google: If I do a good job, Google will never be able to ruin my business (and most probably will never attempt to). Myth #2 busted: If you write high-quality guest posts people eagerly share and link to, you will be loved by everyone (including Google). …Therefore guest posting is bad. I call this one a myth because it’s just an opinion, and moreover, it largely depends on the quality of the guest posting. I’ve just taken a look at my feed reader: Social Media Examiner, Mashable, Search Engine Land, Search Engine Journal—I, along with hundreds of thousands of other people, subscribe to those blogs exactly because they feature guest contributions daily or weekly. 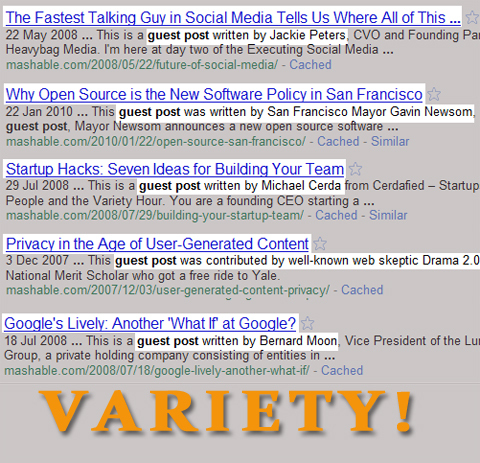 Guest posting is what makes those blogs so powerful. It’s what adds variety of perspectives and styles. Guest contributions make a blog’s content captivating: I’m forced to check those feeds daily (unlike other feeds I have in my reader) because I’m excited to read something different: different opinions, different news, different advice. Of course, it all comes down to strict editorial standards, but featuring quality guest posting is doable and well worth the effort. Now, I don’t mean to say all blogs should start accepting guest posts now. There are many personal blogs reflecting the blogger’s identity that have built a following exactly due to that personal touch. 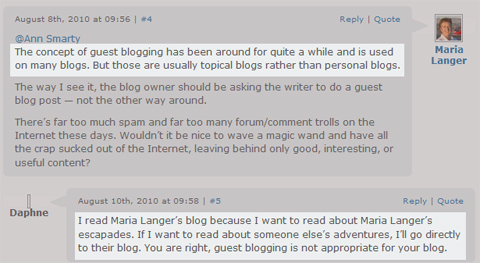 That being said, there’s no definitive answer to whether guest contributors may make a blog lose its identity. What’s for sure is that guest blogging will really change your blog, make your audience more varied and probably change your blog’s future. Myth #3 busted: Guest blogging may make your blog less personal, but for most blogs, adding variety is not a bad thing. What are your thoughts on guest blogging? What other guest blogging myths are you aware of? Share your comments in the box below.